So now that you know how to make miso butter, what do you do with it? The truth is, there are a myriad of things that you could use miso butter on, one of my favorites is on veggies. Especially corn. Page loves corn, and I buy organic non gmo corn at the farmers market whenever it’s in season. I shave it and freeze it. Then I throw it in a pot with no water and allow the water to cook off, once it has I add in miso butter, and let the butter brown. The kernels get the nutty flavor from the brown butter, with an unami flavor from the miso–talk about delicious!! Besides corn, I love it on green beans, sauteed spinach, asparagus, brussel sprouts, cabbage–just about any veggie you can think of, miso butter makes it better. Do you know what else miso butter makes better? Meat! Almost every kind of meat. Steak with miso butter is a revelation! Seafood with miso butter is ascension! 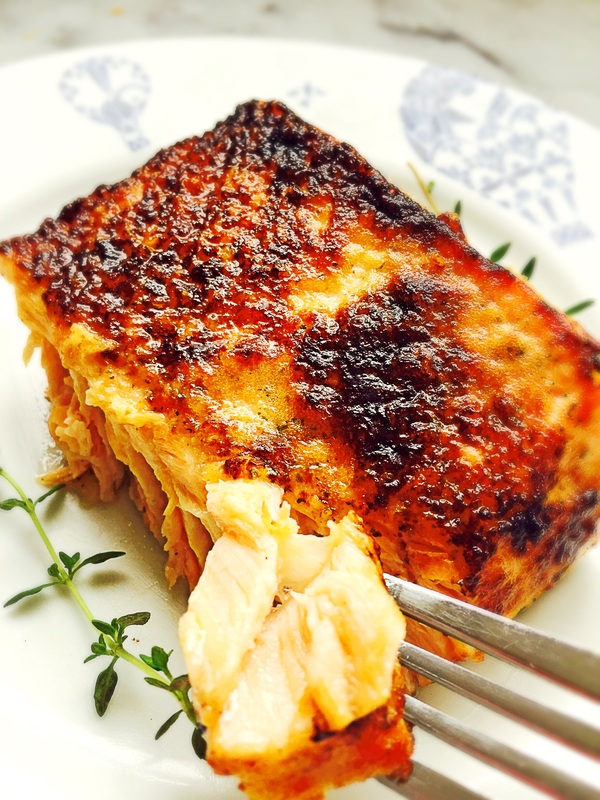 This recipe is so delicious, I find it hard to eat salmon any other way. Every bite of this deserves it’s own moment of silence, it’s own moment of indulgence. Directions: Pre-heat oven to 425F. 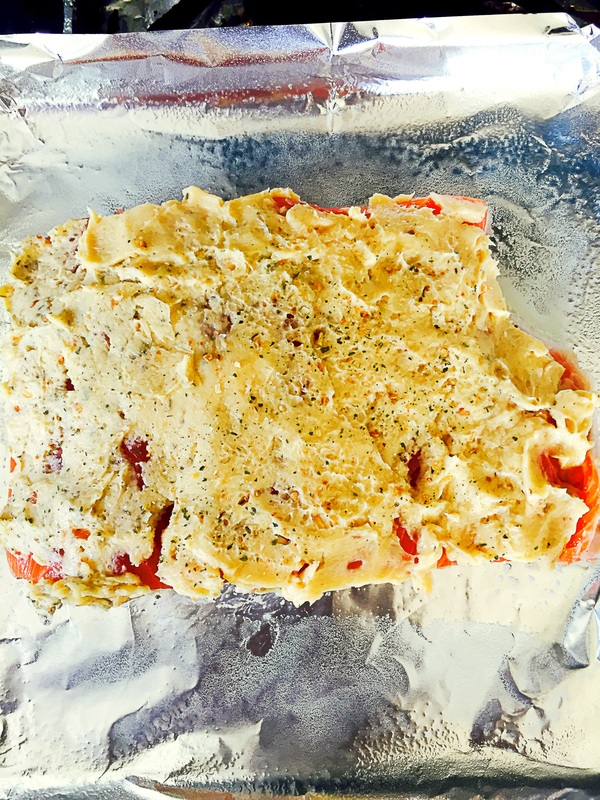 Season salmon steak with garlic salt. 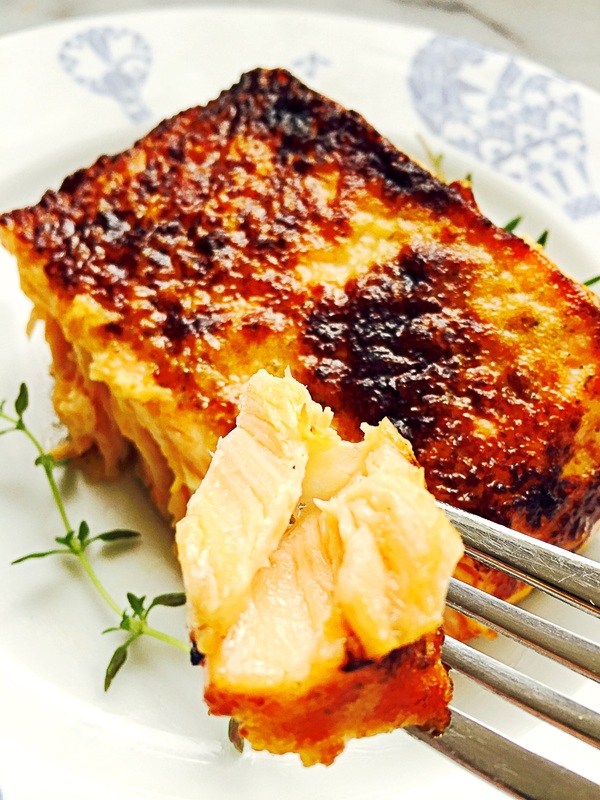 Using a butter knife apply a thin layer of miso butter on the top and sides of the salmon. Place the salmon on a foil lined baking sheet, then place in the oven for 10-12 minutes, or until salmon is cooked through. In my experience 10 minutes is usually the perfect time, you only want to go longer if you salmon steak is thicker than 1 inch. 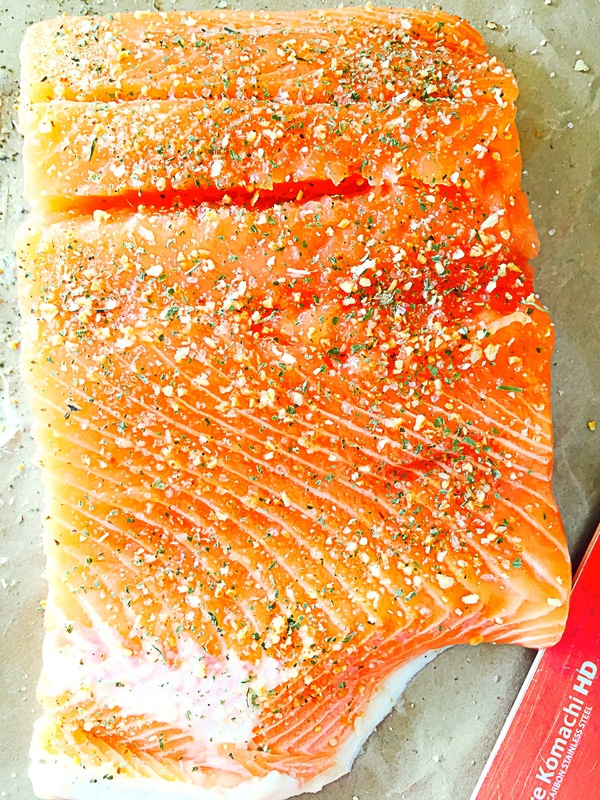 Longer than 15 minutes and your salmon is probably over cooked. Remove the salmon from the oven. It should be nice and caramelized on top. Serve and enjoy! 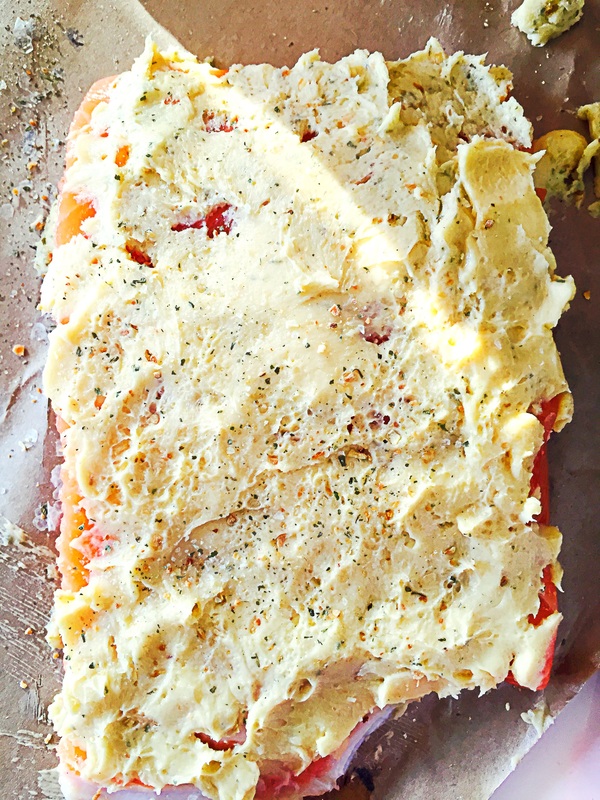 This entry was posted in dinner, Food, Food blog, gluten free, Healthy Whole Food Blog, low calorie, low carb, paleo, quick fix meals, recipes and tagged clean eating, easy dinner recipes, fit food, gluten free recipes. 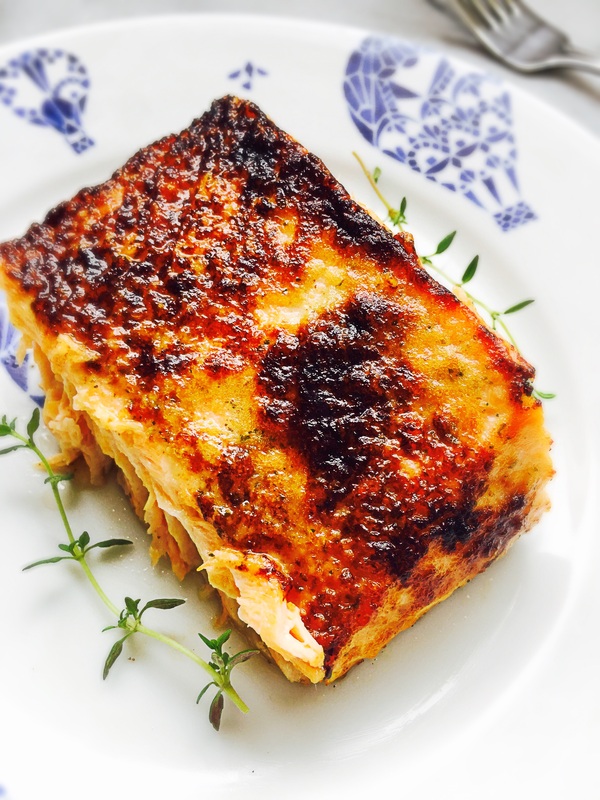 paleo, grilled salmon recipes, kid friendly recipes. 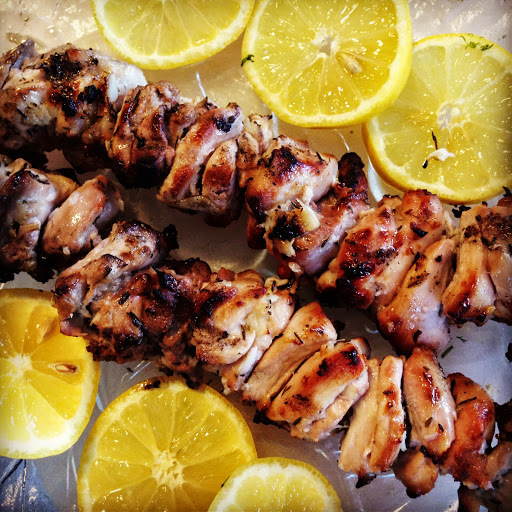 healthy dinner recipes, lazy dinner recipes, low carb recipes, miso butter, recipe, recipes, Salmon, salmon recipes, seafood recipes. Bookmark the permalink.